Have you ever watched professional wrestling on television? Did you ever think it was real? Have you ever been to the International Consumer Electronics Show, held each January in Las Vegas? Am I preparing to break the news of a pro-wrestling exhibition at CES 2008? It is depressing commentary on our society that pro wrestling has developed the devoted subculture that it has. Those who cheer for their favorites appear to be in some sort of trance, devoid of the reasoning faculties that might make them question the truth of what they are seeing. Professional wrestlers and many of the cost-no-object speakers exhibited at CES have similarities: massively built forms dressed in flashy attire; lots of noise, and yammering by the participants about how great it all is; bystanders oohing and ahhing; and all the while, there you are, wondering what the fuss is about. But in the cases of most of these much-ballyhooed behemoths, you wont see or hear the action promised by all the hype. Instead, there will be a lot of form and not much function. In other words, it will look as if a lots happening; in reality, what youll actually hear might be little more than a stage show. There are exceptions. If many of the expensive speakers now available are the audio equivalent of pro wrestlers, the Rockport Technologies Altair ($89,500 USD per pair) is like a finely tuned Olympic athlete: Its extraordinary appearance, though physically impressive, is more about function than showmanship; it has been honed to achieve a lofty level of real performance; and, perhaps most important, the Altair inspires the most awe when its pressed into action. According to The American Heritage Science Dictionary, Altair is a "bright white star in the constellation Aquila." When you see the Altair loudspeaker, you might be tempted to think its just arrived from another world. Its raked-back curves are different from what youll see in any other speaker system Im aware of. There are reasons for this, mostly due to the freedom of form offered by the unique construction techniques used by Andy Payor, engineer-owner of Maines fabled maker of loudspeakers and turntables. Rockport Technologies has two distinct speaker lines: Mira, which you can read more about in my July 1 Mira review; and the newest models above the Miras, the flagship Arrakis ($165,000/pair) and its close sibling, the Altair. As good as the Miras are, theyre more conventional than the super-expensive models. Sure, the same designer dictated the nutsnbolts of each line, but the higher budget allowed the execution of the costlier models to be far more ambitious. Because the Altair is essentially half an Arrakis, what I say about one applies, for the most part, to the other. The extremely costly and complex cabinet construction used for the Altair is intended to accomplish three goals: high stiffness, excellent damping, and lots of mass. Andy Payor asserts that two dissimilar materials are required to simultaneously achieve these disparate conditions, and therefore that any speaker cabinet built from sheets of any single material cant be completely optimized: materials that are stiff generally have poor damping qualities, and materials that are good at damping arent that stiff. But you cant just laminate a few different substances together and call it done -- the precision engineering of Rockport cabinets makes them an absolute bear to manufacture. Ive seen these cabinets in various stages of construction at the Rockport workshop, and can attest to the almost ridiculous level of craftsmanship involved. The result in the Altair, as Rockports objective measurements assert, is a cabinet that is, according to Payor, "an inertial reference." With the Altairs playing music, I could detect no vibrations when I placed my hand on the speakers side panels. Although Andy Payor has been using the same basic formula for his composite, molded cabinets for many years, the drivers in the newest Rockport models are all brand new. 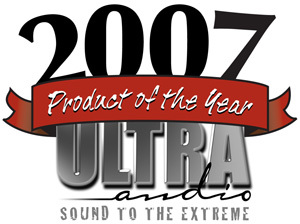 Payor loves the Audiotechnology drivers from Denmark -- some of the costliest and most respected models in the world. But he felt that Audiotechnologys polypropylene cones could be improved on, and decided to design and manufacture his own. The Altair and Arrakis thus include proprietary, Rockport-made carbon-fiber sandwich-composite cones mated to Audiotechnology motor systems (the drivers are assembled by Audiotechnology in Denmark). These cones are designed to be extremely light and stiff, with breakup modes reportedly well outside their operating ranges. The four-way Altair incorporates a 5.25" midrange, an 8" midbass, and a 15" side-firing woofer -- all of carbon fiber-composite construction. The tweeter, Scan-Speaks newest 1" ring radiator, doesnt have a phase plug, unlike the original ring radiator; in fact, it looks more like a conventional dome design. It reportedly improves on the older model primarily in its off-axis frequency response. 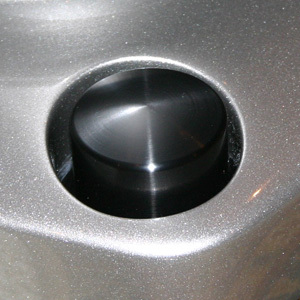 The Altairs rear panel is dominated by a huge port of machined aluminum. Below it sits a single pair of high-quality, rhodium-plated binding posts that rest on custom-made aluminum terminal plates. The overall build quality is simply extraordinary. Ive seen no other audio product that matches it. As for the overall design snapshot, Payor has not pursued one technical goal at the expense of others. According to him, the Altair is engineered to at once have flat frequency response, good off-axis behavior, no discernible cabinet signature, and low driver distortion, with attention also paid to acoustical phase coherence, fast risetimes, and other things. 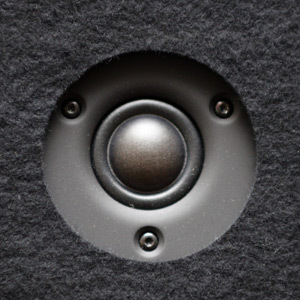 The speaker is also meant to be musically satisfying from a listeners standpoint. During my visit to the Rockport factory, I saw that Payor takes a comprehensive approach, verifying his results through both extensive measurements and long listening sessions with a wide variety of associated equipment. In a speaker review, here is where I usually describe the setup procedure, followed by how the speakers sounded. Ill do that, but the process of positioning the Rockport Altairs itself was extraordinary: While determining the best room locations by moving the Altairs forward and back from the spots speakers usually occupy in my room, I discovered that they could be placed well forward of where large speakers usually sound their best here. They excelled in the nearfield, without any of the negative consequences usually associated with placing speakers so close to the listener: e.g., no imaging, and a lack of driver integration. But not only were there no negatives to positioning the Rockports in the nearfield, there was a huge sonic benefit: Using all of my usual speaker-setup test tracks, I heard the most present, nuanced sound I had yet experienced in my room -- heck, in anybodys room. Perhaps most striking was the downright-happening-in-my-room midrange: Holly Coles cover of "I Can See Clearly Now," from Dont Smoke in Bed [CD, Manhattan 81198], and Becks "The Golden Age," from Sea Change [CD, Geffen 493537], not only imaged perfectly, but were both played back with superb clarity and definition. The piano accompanying Cole was scaled just right. This was truly electrifying sound. The Altair is rated to play in-room down to 20Hz, -3dB, which is quite deep even for a large floorstander. Because placing the speakers well away from the front wall yielded the smoothest low frequencies, the nearfield placement gave me the best of both worlds: smoothly integrated low-bass response along with that revelatory midrange. When I asked Andy Payor about the Altairs surprising ability to play in the nearfield, he said, essentially, that the drivers integrate very quickly off the front baffle. Ill say. Ive never been able to play any other loudspeaker -- not even small two-ways -- closer to the listening position than the Altair and have the outputs of its drivers integrate seamlessly. 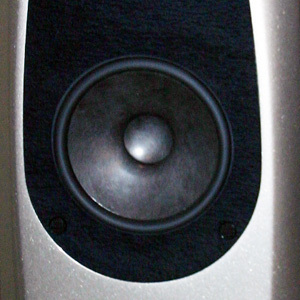 The Altairs were almost a foot forward of where I normally find speakers to work best in my room. Although I paid no price for this placement in terms of soundstage precision or lateral spread, I did gain in another important area: soundstage depth. There was incredible depth when the recording allowed for it. The title track of Laurie Andersons Strange Angels [CD, Warner Bros. 25900-2], an already atmospheric recording, sounded positively otherworldly. The soundstage was not just a conglomeration of layered information, but a seamless new space that seemed to melt the walls of my Music Vault. That magnificent depth, coupled to the delicately nuanced high frequencies, resulted in a magical sound -- I couldnt help but listen to Strange Angels all the way through, even though it was almost 1 a.m. -- way past my bedtime. It almost felt as if I could walk through, around, and behind the individual performers. I pulled out live and studio recordings that I know contain extra helpings of depth, and over and over I heard the same things: Voices and instruments that were placed back in the soundstage were waaay back there, while more upfront vocalists were right up close. All of this soundstage three-dimensionality was mated to ample air in the highs, eerie presence in the midband, and rock-solid palpability throughout the frequency range. Bass articulation was the state of the art, from the midbass through the transition into the lowest notes (those I could only feel, not hear). I was able to get perfectly pitch-defined bass and speedy transients when needed, and, in the lowest register, the Altairs energized my room and could shake the walls. Take seriously that 15" driver and the huge rear-firing port -- I doubt there are many subwoofers on the market that can play lower, and even fewer, if any, that can do it with the Altairs speed and articulation. "Norbu," from Bruno Coulaiss Himalaya [CD, Virgin 8 48478 2], is one of my current reference recordings. The drum whacks on this cut roll through the room in wave after wave of defined low frequencies. But this is no indistinct movie bass, but real-instrument bass with harmonics that need to develop to make the drum sound real. 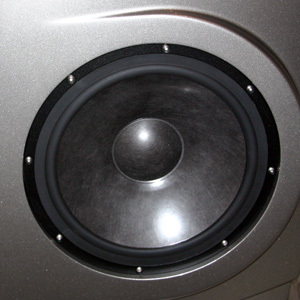 The initial impact must be sharp, and then the speakers have to hold the reverberating note for several seconds. The Altairs established a clear reference point for the reproduction of this song, and moved enough air to pressurize the room while clearly defining the leading edge of the note. I now know how much definition there needs to be in the subbass registers to make music such as "Norbu" sound realistic. The drums in Eiji Que and the Minnesota Orchestras recording of Aaron Coplands Fanfare for the Common Man [CD, Reference RR-93CD] were equally dramatic. Ive listened to this recording many, many times; through the Rockport Altairs, it sounded brand new. High-frequency extension was equal to the best Ive heard. Music with nuanced ambient sounds -- as on many Chesky discs -- was so much fun to listen to. Extremely fine gradations in the treble made me realize just how much musical information most loudspeakers obscure. With the Altairs, there was never any sense that the highs were unnaturally elevated, or were overly prominent within the soundstage. On the contrary, they were balanced and honestly portrayed. Exploring recordings that let this aspect of the Altairs sound shine led me back to what I enjoyed so much when setting up the speakers: The outputs of the four drivers integrated into a single musical entity with absolute perfection. I would love to compare a single-driver loudspeaker -- perhaps a Quad ESL -- to the Altair to see if there are any weaknesses in that aspect of the latters presentation, particularly in the midrange. From what Ive heard, I dont suspect Id find any. However, the Altair would certainly do many things at the frequency extremes that no single-driver speaker could do. Last, I think the Altair sets new standards in several areas. Even with all Ive said above, the speakers overriding character was one of supreme clarity and transparency, which combined to make the Altair an open window on the recording. In the end, music systems are experienced as wholes, not as the collections of bits and pieces we reviewers tend to describe them as. The bottom line was that the Altair played back my recordings in a manner that let me truly rediscover my music collection all over again -- such was the completeness of its presentation. As I write this Im listening to "Be Here Now," from Ray LaMontagnes Till The Sun Turns Black [CD, RCA 83328], and even now, after weeks of listening to the Rockports, I couldnt be more astonished by them. The three most ambitious speakers Ive had in-house in the past year have been the Ascendo System M-S ($45,000/pair), the YG Acoustics Kipod ($38,000/pair), and the Wilson Audio Specialties WATT/Puppy 8 ($27,900/pair). The latter two have bigger brothers that would make for better direct comparisons with the Altair; unfortunately, I didnt have those models on hand. So rather than go through a laundry list of areas in which the Altair surpassed these less expensive speakers, suffice it to say that the Altair is in another league altogether. With the exception of the YGA Kipods standard-setting image specificity, which the Altairs merely matched, I cant think of another area in which any of these speakers approached the Rockports. Perhaps, considering the differences in price, youd expect that to be the case -- but Ive been in this business long enough to have learned that equating price with performance can lead one to jump to wrong conclusions -- and, for the buyer, to disappointment. Its refreshing when more money actually does buy more -- and in this case, much, much more. Perhaps the more interesting comparison -- if not necessarily the most relevant to the buyer of one or the other -- is with another Rockport speaker, the $13,500/pair Mira. In my July review of the Mira, I concluded: "Considering everything, the Rockport Technologies Mira is one of the best loudspeaker deals in all of high-end audio -- and maybe the best that Ive come across." I stand by those words, but the reality is that the Mira doesnt come close to the Altair. First, the frequency extremes: The Altair was more extended than the Mira, not just on the bottom end, but up top as well. The Altair presented an airier, more detailed treble, with absolutely no hint of distortion or congestion. It seemed to extend forever, matching any ribbon-based design Ive heard. Second, and perhaps owing to its more inert cabinet, the Altair presented music against a background as silent as deep space -- even more so than the Miras, which is no slouch in this area. Third, the Altair could play with more lower-midrange weight, which made instruments such as the acoustic piano sound more realistic and lifelike. The Altair isnt just a bigger Mira; its an altogether much better speaker. 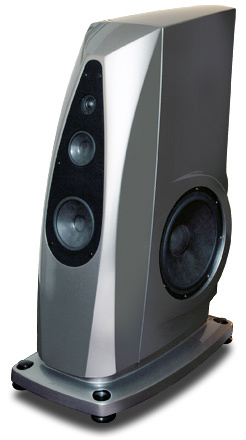 The Rockport Technologies Altair is not the largest or most expensive loudspeaker on the market -- although, by almost every standard, it is very expensive. It also doesnt wear its many technological advances on its sleeve. Both of those facts are all right with me. Henry Ford once said: "You cant build a reputation on what youre going to do." Thats true in sports, but its not always the case in high-end audio. What separates a true world-class athlete from a blustery pro wrestler, among other things, is that the athlete delivers the genuine article. Ive heard many expensive speakers that fail to fulfill the single promise made for all of them: making music sound real in the home. The Altair does that one thing, a fair challenge by anyones measure, better than any other speaker Ive heard -- in the Music Vault or anywhere else. Forget what youve seen, read, or been told. Go and experience the Rockport Altair and youll hear what youve been promised too many times. I look forward to exploring its musical capabilities for many years to come: Ive made it my reference loudspeaker.